Welcome to Champion’s Rx, a high-intensity daily workout program designed for individuals that are currently active and that incorporates all ability levels. The workouts have been divided into three main classes. Class A is for individuals who can use all four limbs, individuals with ambulatory CP, and individuals with limb loss. Class B is for individuals who have use of their upper body, including some core. This may include individuals with paraplegia, some individuals with CP, and individuals with double above the knee limb loss. Class C is for individuals with limited use of their upper body with possible impairment in their grip. This may include individuals with quadriplegia and those with highly involved CP. As no two disabilities are the same, you will need to decide which class fits you best. Some days you may be able to do all the exercises in one category, while other days you may need to use one or more of the exercises from a different category. Make the workout fit you. And if you find a new adaptation to an exercise, let us know. Champion’s Rx assumes that you have access to a gym or at least some degree of exercise equipment. Every day you will find a new number of sets and reps. Reps will be shown as the number or numbers you see. Sets will be shown as how many times you see those numbers. For example, if you see 20 - 15 - 10, then you will be performing three sets: the first will have 20 reps, the second will have 15, and the third will have 10. Mondays, Wednesdays, and Fridays will concentrate on strength training exercises. Tuesdays and Thursdays will focus on cardio. Champion’s Rx is designed to prepare you for a multitude of sports and activities as well as help you increase muscle strength and alter body composition. If you are not currently active or don’t have access to a gym you can check out our 14 Week program at www.nchpad.org/14weeks for an exercise routine that might be more appropriate for you. Complete 50 of each exercise before moving on to the next. Disclaimer: Proper precautions must be taken before you begin an exercise program. An understanding of your current health status and potential problems is necessary for you to exercise safely. Please contact your physician if you have any concerns. This program is intended to incorporate high-intensity physical activity into your daily life, but should not be used in place of physical therapy, professional medical advice, or treatment. Class A is for individuals that can use all four limbs, individuals with ambulatory CP, and individuals with limb loss. Class B is for individuals that have use of their upper body, including some core. This may include individuals with paraplegia, some individuals with CP, individuals with spina bifida, and individuals with double above the knee limb loss. Class C is for individuals with limited use of their upper body, including very limited core, with a possible impairment in their grip. This may include individuals with quadriplegia and those with highly involved CP. Think you have what it takes to design a workout for the Champion's Rx? Send us your workout and you could be featured in an upcoming daily dose. Click here to read the rules and eligibility and to download the form for submission. 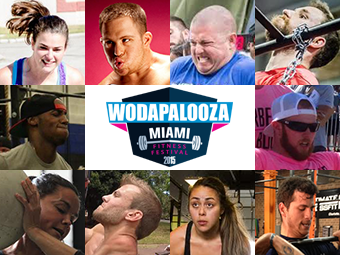 Champion’s Rx would like to highlight some champs that will be competing in the first ever adaptive division of the WODAPALOOZA crossfit fitness festival in Miami. Check out their biographies by clicking the banner below.